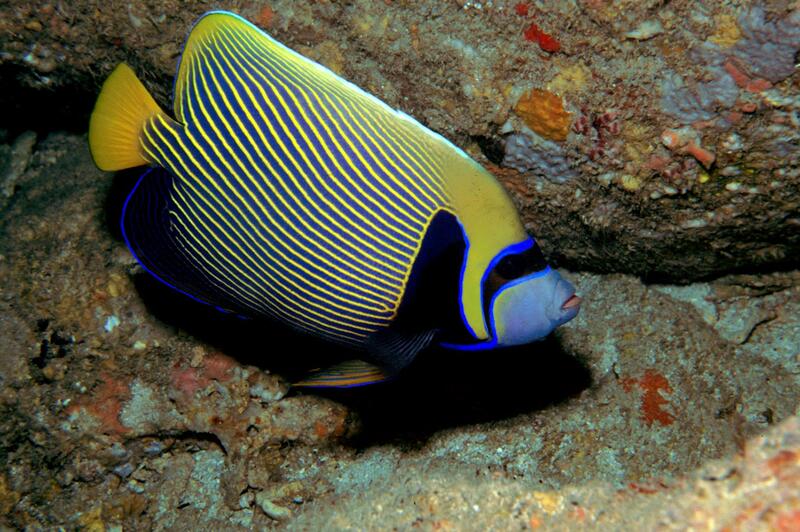 The adult emperor angelfish has yellow and blue parallel lines. By contrast, the young are dark blue with concentric white lines similar to a fingerprint. Its body is fairly round and flat. Its maximum size is 40 cm. 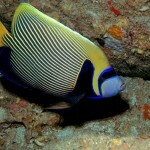 This fish lives alone or in pairs, although some males form harems. It is highly territorial with those of its same species. Its feeding is omnivorous as it eats invertebrates (sponges and ascidia) and seaweed. These fish are highly territorial, which is why they always appear in the same area, the males defending their territory and their females. This territory includes a minimal area of 1,000 m² and every day the males visit all of their females. It lives on coral reefs at depths of 1 to 70 m.
The emperor angelfish lives in warm waters in the Pacific Ocean and the Red Sea. The young forms are navy blue with white concentric stripes, totally different from their parents. In this way, the young show that they are still not mature to be considered competitors in the territories or couples, and they are allowed to feed on the reef along with their parents for the months they take to reach maturity.